The Celine Adele CL41377/S 086 is a Dark Havana wrap style this is a statement piece that is set to make a huge impact over the coming months. If you like the Kardashian ZZ top this is a new frame that will be your cup of tea. The sunglasses have the fashionable oversized look, and are a statement piece favoured by fashion editors worldwide with a flat top style. Make the streets your own catwalk with the Celine Adele. The frame looks great on the streets or on the beach and being oversized graphic style hide who or what you are looking at whilst be extra protective. 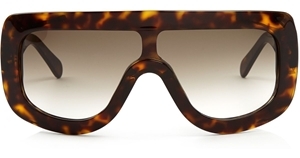 As you see from the images finally men are cottoning onto Celine for Sunglasses for their lightweight and stylish approach. The Celine CL 41377S sunglasses come with the 12 month no quibble sendoptics guarantee.